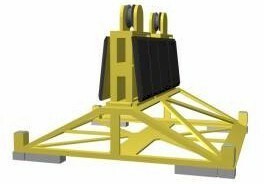 The Top Lift Fixture, or TLF, is a mechanical fixture designed for use in transferring Navy pallets and containers fitted with SPIs via connected replenishment gear, VERTREP slings, pierside cranes and other such overhead devices. The TLF locks onto the Standard Payload Interface. Loads can be—individual units or in stacks of units on SPIs, as configured loads. A full-scale prototype of the TLF device was built and successfully tested at NSWCCD Ship Systems Engineering Station in Philadelphia in May, 2003. Top-Lift Fixture Prototype in use with overhead crane to remove entire stack of SLAM-ER missiles from the Ship Motion Simulator. This container is the largest and heaviest of the Navy legacy containers. NAVSTORS subsystems at the kingpost as a configured load arrives during CONREP transfer operations. During CONREP, the payload being transferred between ships naturally swings about on the highline due to ship motion and wind. As a result, today, when it is brought aboard the receiving vessel at the CONREP kingpost and deposited on the deck, it must be restrained by a crew of line handlers. 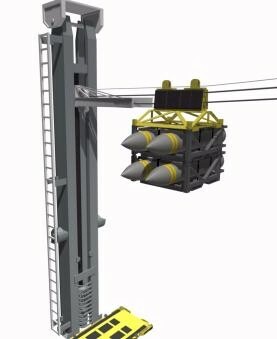 In high seas, this can be a difficult and dangerous task, particularly working with ordnance payloads that can weigh over two tons each. 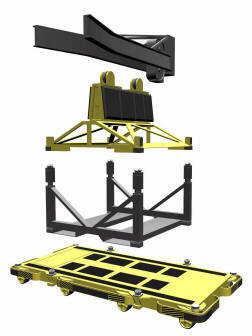 Moreover, the payload cannot be deposited on the deck—or, with the NAVSTORS system, onto a waiting Omni-directional Guided Vehicle (OGV)—with any degree of accuracy. In this context, Agile Systems has developed a special device to be attached to the vertical slide on each CONREP kingpost to capture and restrain the incoming payload as it approaches the kingpost. Mounted on the vertical slide of the kingpost, this “CONREP Trap” is envisioned as a passive structure that engages, stabilizes and guides the Top-Lift Fixture into place on the slide. Once secured, the Top-Lift Fixture and its payload can be quickly lowered into place onto the stanchion receptacles of the OGV with adequate precision.